Enter the mortgage principal amount and the length of the mortgage in years. 30 years is the most popular term in the United States, though the 15 year mortgage is also becoming more popular. In countries such as Canada 5 year and 10 year mortgages are more common. Then, either enter a starting interest rate and select the percentage to increment the comparison rates, or enter a rate for each of the five "Interest Rate" fields. You can find the current APR by visiting your bank, or looking them up on Freddie Mac's weekly mortgage survey. For your convenience, to the right we have synidicated Freddie Mac's current rates. Whether you are a first-time homebuyer or you are seeking to refinance your property, mortgages and interest rates can be overwhelming if you do not understand the basics of these concepts. To ensure you obtain the best mortgage to meet your needs and your budget, there are a few factors you must first consider. Mortgage rates change daily based on both international and national economic factors. However, regardless of the specific rates, mortgages greatly impact real estate values and loan costs for potential homebuyers. Nearly all repayment schedules are calculated based on a compound interest formula. In the beginning of the repayment period, you are paying little on the principal so your annual interest rate is added to the balance on your mortgage every month; your principal balance does not go down much, if at all. However, by paying a lump sum, one point for every one percent, to the lender at the time you obtain the loan, you can expect a lower interest rate. For most types of loans, lending institutions offer mortgages with combinations of interest rates and points. Typically, the lower your interest rate, the more points you can expect to pay at settlement. Interest rates specifically affect your monthly payment, while points affect the amount of money you will be required to pay for closing and settlement costs. Additionally, while some may believe that the prices of homes will fall after mortgage rates rise because fewer people may qualify for mortgages, such as not been the case throughout the history of the housing market. Interest rates on mortgages are determined by economic growth and inflation expectations, two factors that combine to set the supply and demand for credit. Mortgage rates typically rise when consumers feel confident about buying homes; inflation is increasing real estate values and more consumers have solid employment. However, when interest rates fall, real estate prices increase. More people are seeking opportunity to capitalize on the lower interest rates and may be more willing to pay a higher price for their homes. If potential homebuyers are in a sufficient state to purchase a mortgage, few will care about the total cost of the home if they can obtain a lower interest rate. Roughly 25 percent of Americans plan to purchase a home in the next decade and 56 percent currently own a home, according to Gallup's annual Economy and Personal Finance survey. However, sometimes potential buyers fall in love with a residence only to find out that they are not in the correct financial situation to qualify for the home; some may barely qualify but obtain a sky-high interest rate. To prepare yourself for buying a home, you must be in good fiscal shape or appear well-rounded on paper. You want to avoid any surprises when a loan officer pulls your credit report, and you may qualify for a better mortgage rate, allowing you to save money over the life of the loan. Also consider having a savings account to cover both the closing costs and any unexpected repairs. Before applying for a home, you will want to meet with a mortgage official to receive pre-approval to learn where you stand. You will want to obtain a copy of your credit report so that you see what is holding you back and to look for items that you did not know existed. Should you find that your credit needs improving, do your best to settle or pay off any debts that may have been sent to collections. If you know that some debts are no longer valid, write to the creditor and ask for validation. However, even if you pay the account, it may still remain on your report for five or seven years, depending on the type of debt. Additionally, consider using a mortgage calculate to show you how much home you can purchase based on the average interest rate, your income and the length of the loan. A debt-to-income ratio calculator that shows how much of your income will go to paying the debts is also helpful; if the ratio is greater than 36 percent, you may want to consider resolving your debts prior to applying for a mortgage. You will also want to pay every bill on time, especially if you are moving. You do not want to miss out on a final electric bill by neglecting to provide a forwarding address; this will harm your credit and set you back, preventing you from obtaining a competitive mortgage rate. Potential buyers should try to stay in the black; even overdraft fees are red flags to underwriters. Although the lender may only pull your two most recent bank statements when you physically apply for the loan, if you cannot stay in the black, you most likely are not ready to purchase a property anyway. Your financial situation also includes job stability. Banks look unfavorably on those who switch jobs at the same time they are hunting for a home or applying for a loan. Even if you find a job that pays more than your current employer, the lender may not allow you to switch companies before the loan closes. If you are thinking of finding another job, try to do so well before you apply for a loan. Otherwise, you may have to wait until after the closing process is finished. Finally, start saving money as soon as you are first considering purchasing a home, and save more money than you think you will need. After you speak to a lender, you will have an idea of how much house you can buy with the finances you have available, as well as the requirements for the down payment on that particular loan. To obtain the most competitive rates, contact a variety of financial institutions. Interest rates fluctuate constantly, sometimes because a financial institution is promoting a particular loan product. For example, some lenders who are eager to generate more purchase loans may offer better mortgage rates for homebuyers but not for those seeking to refinance their current property. Additionally, sometimes a bank or credit union will introduce a new product and offer more competitive rates in order to entice new borrowers to sue their services. Diversify your search and try a variety of places including a national bank, a community bank, a credit union, a regional bank and a direct lender. Whether a lender requires homeowners to pay for private mortgage insurance (PMI), the specific type of loan and your interest rate will all affect how much you will need to borrow and the amount of down payment that you will need to pay before purchasing the home. 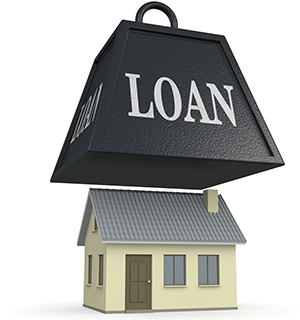 The down payment itself reduces the amount of the loan in relation to the home's purchase price. A homebuyer may obtain a conventional mortgage with the less-than-traditional 20 percent through PMI or government programs that exist to help low income buyers or those in dire financial situations. However, the smaller the percentage of the down payment, the larger the monthly payment will be. For conventional financing, if you are looking at a down payment lower than 20 percent, your loan-to-value ratio will be 80 percent or higher. In these cases, the lending institution may require you to pay PMI because they are increasing their potential risk of loss if you should go into default; they are lending you more money so that you may purchase the home. However, PMI also increases your monthly mortgage payments. You must consider if it is worth it to pay PMI each month to receive other benefits of homeownership or if it would be in your best interest to save up for a few more months and put a larger down payment on the property. Homeowners can pay 3.5 percent on an FHA loan with higher mortgage insurance costs while a down payment of between five and 10 percent on a conforming loan will mean lower PMI payments. However, a down payment of 20 percent will completely eliminate the cost of PMI. When lending institutions advertise the interest rate for their mortgage products, many factors play into the calculation of the rate. Banks use the federal funds rate, the discount rate, the prime rate, the bank's necessary profit margin and the risk associated with each individual borrower to determine the amount of the interest rate. The two Federal Reserve rates impact how the government prices the prime rate; many banks and mortgage lenders use the prime rate as a basis for pricing their mortgage products. In other words, the prime rate is the index or the baseline for setting each individual mortgage rate. The lender then adds a margin to index to determine the final, fully-indexed mortgage rate. While the margin amount is completely up to the bank, the institution often adds enough of a margin so that it can still make a profit on the product but stay competitive with other lenders at the same time. The more that the companies have to handle in terms of mortgages, the higher your rate may be. Additionally, different mortgages rest largely on economic developments and come in many forms with different conditions and terms. Combined, the variables result in different mortgages with varying interest rates. Rates depend largely on when in the economy you wish to purchase a home. Timing is important for both you and the lender to help maximize the return on the investment. For instance, you may prefer to finance your home with a low interest rate to keep the financing cost low for the duration of the loan. On the other hand, a lending institution may prefer to charge higher rates to obtain a higher return on the loan. Generally, purchasing a home during periods of economic growth may lead to a higher interest rate. However, rates during a slower economy may be lower because of diminished activity and the downward pressure that is often placed on interest rates as the public's demand for investing, borrowing and money generally slows down. Secondly, both the 10-year Treasury Bond yield and the Consumer Price Index (CPI) are two interest rates that will influence mortgage rate changes. An increase in cost of these items will indicate higher pressure on the economy; the CPI helps lending institutions adjust their interest rates to ward off inflation. By the same token, the 10-year-Treasure Bond is often looked at as a reliable measure of long-term interest rates. As the yield fluctuates, lenders adjust their rates accordingly so that they remain profitably in the long run while offering a variety of rates over time. Before approaching a lender and beginning the process of applying for a mortgage, it is important to understand what types of mortgages are available and the disadvantages and advantages of each of them. A fixed rate mortgage is one in which the interest rate remains the same for the duration of the loan. The interest rate does not change for a set amount of time; almost 75 percent of all home loans are fixed rate mortgages. These rates typically come in increments of 10, 15 or 30 years. The advantage to having a fixed rate mortgage is that you know exactly what the principal and interest payments will be for the life of the loan, allowing you to budget easier because you know that the rate will never change. These rates are predictable in that the rate is agreed upon at the beginning of the loan. Your monthly payments will remain the same. However, if you purchase a fixed mortgage rate when rates are high, you may be eligible to refinance once the rates go down again, but the rates are typically higher so your monthly payment will be higher. An adjustable rate mortgage (ARM) is a mortgage loan in which the rate changes based on a schedule or after a fixed period of time. These loans are often riskier because the payment may increase significantly when the rate is scheduled to change. However, to help level the risk, homeowners are rewarded with a lower interest rate spread. Obtaining an ARM may allow you to qualify for a higher loan amount and a more valuable home. Those with large mortgages can receive an ARM and refinance the loan every year; the lower rates allow you to buy a more costly home yet you pay a lower mortgage payment than a fixed mortgage rate. However if rates increase significantly at any point during the loan, the homebuyer may quickly find themselves unable to make the increased interest payments at the new higher rate. By understanding the different types of loans, how to prepare yourself for the loan application and to purchase a home, you can increase your chances of obtaining a competitive mortgage and interest rate. It is vital to make sure that you have all the necessary items in place before applying for a mortgage so that you do not encounter any surprises along the way.